Welcome to “11 Questions with…”. This edition’s guest is Mara Rubinoff Shapiro. 2. Your life partner… tell us about them. I have 3 incredible, almost grown children. My first-born is Skylar (also known as Sky). She’s 23 years old. She’s a beautiful, hard-working woman, doing double-duty as working full time at a tech start-up called Muse and part-time as an extraordinarily talented makeup artist. She’s smart, funny, and a little bit weird. She gets it from her momma. It’s been wonderful to watch her journey as an adult begin. She recently got her own apartment with her boyfriend and a puppy to boot. Like a true millenial, every few months she and her guy take off to travel to a far off place. I can’t deny that I’m a little bit jealous, but since she my best friend I’m ok to live vicariously through her. I’m forever grateful to have this girl in my life. Next comes Ben (I call him Bennie or Bubs). He’s nearly 22. I hate to brag (no I don’t), but he’s absolutely brilliant –both as a student and a human. He’s finishing up a degree in Neuroscience at the University of Western Ontario, and is now planning his next steps, be they travel, grad school or something completely unexpected. Our resident Jack-Kerouac-loving hippie loves philosophy, mindfulness, music and the outdoors. He’s so full of warmth and sweetness and is an exceptionally intuitive and wise person (his favourite saying is ‘just let people be to do their thing’). He’s banking a lot of karma with his charitable activities and is very involved with his fraternity. Some of my favourite moments are sitting down for an epic chat with him or forcing him —and his brother—to snuggle with me in my bed. If you believe in reincarnation, he’s my grandfather come to join us once again in this life. And for the grande finale…. say hi to Jonah (also known as Shaps or Little J). At 18, he’s on the cusp of beginning his great life. He just started an engineering degree at the University of British Columbia, and he’s killing it even though it’s killing me that he’s at school so far away. I like to call Jonah my little buddy (even though he’s taller than me), as we’ve spent so much time together learning and growing. I do believe that this boy has been my life’s work and my greatest accomplishment in life. It’s been so gratifying to watch him transform, grow and succeed while overcoming the challenges of ADHD like a champ. The proud owner of the Trifecta of fun, he’s also got a learning disability and is gifted which means he has a unique way of thinking that both propels him forward and holds him back too. But what makes me the most proud is that he’s never used his challenges as an excuse to get out of doing something or as a fallback. He just powers ahead, full steam. My baby boy is super smart (maybe a little too smart for his own good), but even more importantly, he’s kind, sweet, empathetic, and thoughtful. He’s also a great outdoorsman so if your goal is to live in a shack in the woods you should definitely bring him along. I’ve got two dogs. A very nervous Schnoodle named Maxie and a very mischievous Shih-Poo named Zeppie (yes, after the legendary band Led Zeppelin). With my empty nest, these two have become my surrogate children and I have to make sure I don’t become a crazy dog lady. They love to play and snuggle and beg for treats. You can follow Zeppie on Instagram at @Led_Zeppie. Maxie doesn’t like having her photo taken so she doesn’t have social media. Parenting is full of so many challenges and triumphs at each stage that it’s hard to pick one. But I’d have to say that letting go has been by far the biggest challenge that I’ve faced, after raising a child with ADHD. When you’ve made your children your world it’s hard to let them fly free to experience life for themselves. But it can also be very gratifying once one gets over oneself. Of course, I’ve been practicing for years and I tried not to micromanage them. Throughout their childhoods I’ve given them measures of guided independence, or as I like to say, just enough rope to hang themselves. Without the grit they’ve developed by making their own mistakes and then figuring out how to come back from them, I think I’d worry so much that it would be even harder to let them go. So knowing they’re well-equipped has definitely made it easier. Of course, managing Jonah’s ADHD runs a close second when it comes to parenting challenges, but I have to remember that that was his challenge not mine. All I could do was be loving and supportive and give him the tools he needed to succeed. He’s the one who did all the work. I’ve always wanted to be an author. But it’s never too late. I’m only 49. I’ve got lots of time. I would also liked to have been a therapist. Ask anyone if I like giving advice. Too bad it’s usually unsolicited. Having said that, I believe being a great mom was a career as well. Now that’s a great job that will pay me back in so many different ways, for years to come. That’s a hard one. I think some of my teachers really inspired me to love learning and books. And my Dad really inspired me to be my best self. He never settled for mediocrity, and had high expectations of me. If I got 99% he wanted to know where the 1% went. He also taught me how to show love and make others feel loved, how to hug like a champ and how to cook. He also exposed me to great art, music and theatre. So I’d have to say it was my Dad. Well right now I’m a lone wolf, so I don’t really have to do a lot of juggling. When my kids were young, I went between working full-time and being a Stay-at-Home Mom. When I worked full time I always had a live-in nanny. I was very fortunate in that way, and it allowed me to really be present with my children when I wasn’t working since I didn’t have to worry about chores and the like when I was at home. Regardless of schedules, we always had dinner together and that enabled the 5 of us to reconnect as a family daily. I had no problem ignoring housework to do something with my kids, even if it was merely to read a book or have a quick chat, and I think that’s when the balance comes in. Oh also, FYI – there is no such thing as balance. Something’s always going to be weighted heavier, and something’s always going to have to give, and for me the kids and my family came first.Their childhoods are so short and giving them a great experience and making even the smallest moments special was so much more important to me than folding laundry. Relax! It’s all going to be fine. It’s just motherhood. They bounce. Also, savour the moments. It goes by fast. It’s also as amazing as you think it is. The love will literally overflow. Well… that’s an interesting question. My dad actually gave me the best advice when I was obsessed with my newborn daughter. He said, “Make sure not to lose yourself in your children. Because one day they’ll be grown, and you won’t know who you are anymore.” I’ve really tried to adhere to that advice, and now that I’m living it, I know that he was right. See question 9. In all seriousness, my most important piece of advice is not to worry what anyone else is doing or saying. Don’t compete with other parents, don’t ever let anyone make you feel like you’re not doing a good job. Erase the term Mom Fail from your vocabulary. Don’t feel pressed to take anyone’s advice unless it fits with your own value system. Nobody knows what’s best for your child better than you. So just take what you can from others and ditch the rest. At the end of the day we can only do our best and that’s the best we can do. 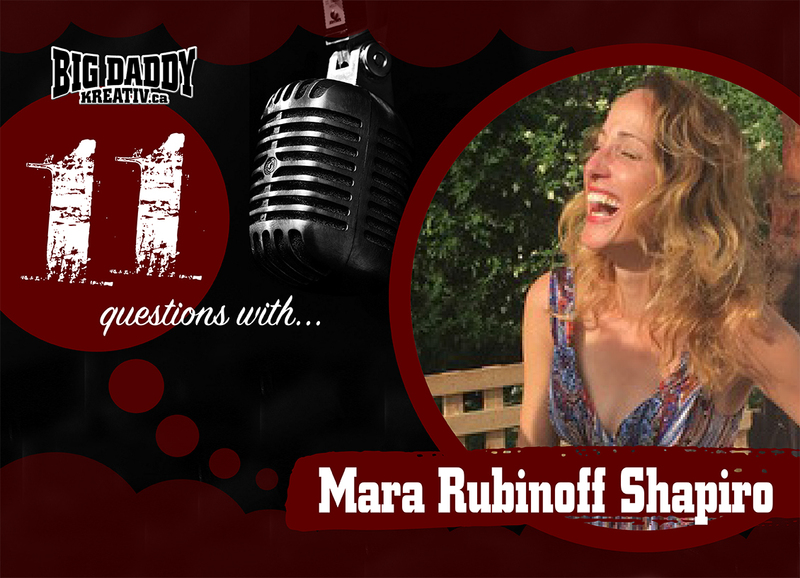 Get social with Mara Rubinoff Shapiro! Be sure to visit Mara’s blog, and follow her on Twitter, Facebook and Instagram. You can also follow brazenwoman.com on Facebook, Twitter, and Instagram. “11 Questions with…” is an on-going feature. I will be interviewing parents with the same 11 questions, who, like me, live in the digital world. The goal is to examine different perspectives, advice, challenges, and experiences from how people parent their children, and live a successful work / life / online balance.